These were super fun to create, but a little messy, I must confess. 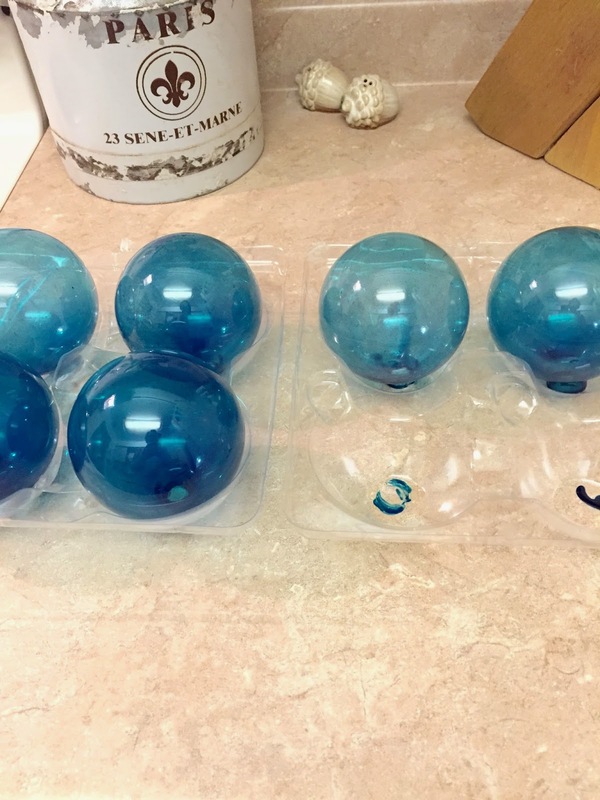 I had some left over glass Christmas ornaments and I knew these were the perfect size and shape for this project. I used Vitrail turquoise glass paint thinned with a little bit of acetone. I removed the hooks, poured a small amount of acetone in a bulb, then poured in a small amount of the glass paint. Swirl it around to completely coat the bulb. I placed a napkin over the end and shook to make sure I had full coverage on the inside. Then flip upside down to drain the excess and let dry over night. Making the rope netting covers was no small task. After a few pinterest searches, I found the best tutorials and gave it a shot. I love the end result. These make my heart sing!!! !